In April 1978, H. William Menard became the Survey's tenth Director but remained only through the balance of the Carter administration. Menard was a recognized worldwide authority in marine geology and oceanography and had discovered notable topographic and structural features of the sea floor that laid much of the foundation of the plate-tectonics revolution in geology. Menard, who had graduated from the California Institute of Technology in 1942 and received a doctorate from Harvard in 1949, had been a marine geologist with the Naval Electronics Laboratory in San Diego for several years and then had become a member of the faculty of the Scripps Institution of Oceanography. In 1965-66, he was associated with the Office of Science and Technology in the White House. A member of the National Academy of Sciences, Menard was a recognized worldwide authority in marine geology and oceanography and had discovered notable topographic and structural features of the sea floor that laid much of the foundation of the plate-tectonics revolution in geology. For Menard's first full fiscal year in office, a year that included the centennial of the establishment of the U.S. Geological Survey, the Survey's appropriation was about $640 million, augmented to 3.7 times the appropriation for the fiscal year 1972 for contractual services in connection with the operation of the National Petroleum Reserve and by the persistent inflation of the 1970's. The total funds available were about $765 million. The Survey staff numbered more than 12,000 scientists, engineers, technicians, and administrative and support personnel, about three-fourths of them full-time employees. The 100th anniversary of the establishment of the Survey, one of only a very few Federal agencies to survive for 100 years with its original name and mission unchanged, was celebrated in ceremonies at the National Center and other major facilities on March 2 and 3, an international symposium in the fall of 1979 on resources for the 21st century, in symposia or technical sessions at meetings of the Geological Society of America, the American Association for the Advancement of Science, the American Chemical Society, the American Association of Petroleum Geologists, the National Academy of Sciences, the American Congress on Surveying and Mapping, and the American Society of Photogrammetry, and in articles in newspapers and magazines. 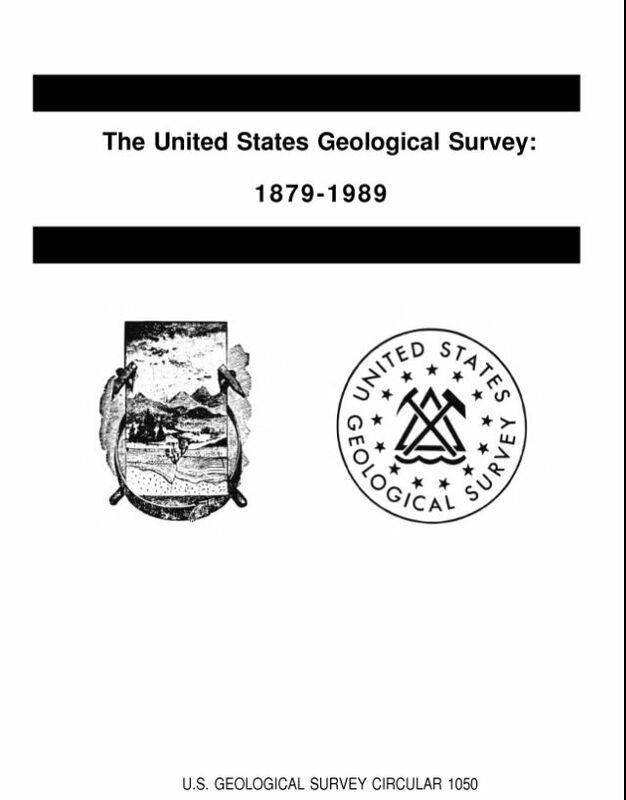 The Survey itself issued two special publications--"Maps for America," covering the cartographic products of the Survey and other agencies, and "Minerals, Lands, and Geology for the Common Defence and General Welfare * * * Before 1879," the first of several volumes on the history of geology in relation to the development of public-land, Federal-science, and mapping policies and the development of mineral resources in the United States. Advanced age did not bring about any diminution of activity and change in the Survey, but rather the reverse. The truth of Director Walcott's statement in 1900, "Every investigation undertaken to solve some geologic problem, whether it prove successful or not, is sure to develop other problems, and the geologic Alexander will never lack worlds to conquer,"38 was never more evident. The Survey's 101st year was marked by the largest earthquake in California in 25 years and the disastrous volcanic explosion of Mount St. Helens. In both areas, geologic-hazards investigations had previously been underway. The earthquake, on the Imperial fault near the international boundary between the United States and Mexico, on October 18, 1979, caused $30 million in damage and generated the most comprehensive set of data on ground shaking and structural response recorded from a damaging earthquake anywhere in the world. The region had been under intensive study by scientists and engineers of the Geological Survey and other institutions because of the frequent seismic activity and the possibility of a repetition of the Imperial Valley earthquake in 1940, and the shock was thus the first damaging earthquake in California's history for which the actual surface rupture zones had been defined by careful mapping before the event. The eruption at Mount St. Helens, in the Cascade Range of Washington, on May 18, 1980, removed about 1,300 feet of the mountaintop and filled the valley of the North Fork Toutle River with a massive debris avalanche for a distance of about 17 miles downstream. Survey geologists had pointed out in 1978 that Mount St. Helens, which had a long history of spasmodic explosive activity, would probably erupt violently in the future and that such eruptions would "affect human life and health, property, agriculture, and general economic welfare over a broad area. "39 An earthquake on March 20, 1980, immediately northwest of the summit, followed by a swarm of earthquakes directly beneath the volcano, was recognized as possible symptoms of an impending eruption by University of Washington scientists working in cooperation with the Survey in a study of the geothermal potential of the region. The Geologic and Water Resources Divisions began collecting and assessing data and, with the Office of Earth Science Applications, determined that the possibility of an eruption was great enough to issue a hazard warning. On March 27, the Geological Survey issued a Hazards Watch summarizing the potential hazards from an eruption. That same day, the volcano began to erupt steam and ash. On April 3, and again on April 30, the Survey updated its Hazards Watch, and the Governor of the State established two "hazard zones" into which access was limited. Loss of life on May 18 was thus minimized. Following the first eruption, the Geologic and Water Resources Divisions continued monitoring the volcano, and the National Mapping Division, which had compiled special maps to record preeruption changes, prepared several new special maps to aid general planning by scientists, land managers, law enforcement officers, and emergency support personnel in the devastated area and for recording scientific and resource data. Several changes in the Geological Survey's organization were made in fiscal year 1980. In the Office of the Director, the Land Information and Analysis Office was renamed the Office of Earth Science Applications, given more specific responsibilities to coordinate multidisciplinary multidivision programs, and strengthened by the transfer of some elements of the former Publications Division. The National Mapping Division was formed from the Topographic Division, parts of the Publications Division, and the Geography Program of the former Land Information and Analysis Office. The organization of the Conservation Division was modified to separate onshore from offshore program management, increase the number of geographic service areas, and separate royalty management from field operations. In January 1981, as the Reagan administration took office, H. William Menard submitted his resignation in order to return to research at the Scripps Institution of Oceanography in California.